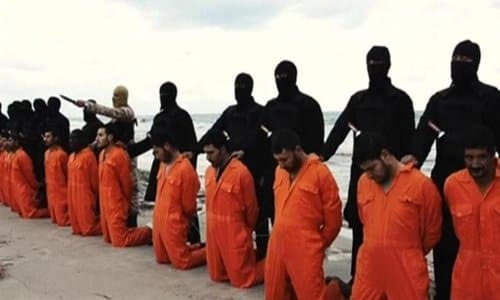 This week in 2015, 21 men were brutally beheaded on a Mediterranean beach in Libya, by members of ISIS. They had been captured by ISIS a few months earlier and pressured to renounce their faith in Christ and convert to Islam. These 21 modern martyrs chose their faith and love for Jesus Christ over the opportunity to extend their mortal lives.... All were given the opportunity to convert to Islam to save their lives, yet each chose the love they had for Jesus above the love they had for their families and own lives. Reportedly, the Ghanaian captive on seeing the faith of his fellow Coptic Orthodox captives chose their faith and death over saving himself. Inasmuch as the 21 martyrs should be remembered and commemorated, the fact is, they are ultimately modern day reflections of an ancient (and ongoing) phenomenon that permeates nearly fourteen centuries of history: Muslims slaughtering Christians who refuse to renounce Christ and embrace Muhammad. In 838, Caliph al-Mu'tasim--at the head of eighty thousand slave-soldiers--burst into Amorium, one of the Eastern Roman Empire's largest and most important cities. They burned and razed it to the ground and slaughtered countless; everywhere there were "bodies heaped up in piles," writes a chronicler. The invaders locked those who sought sanctuary inside their churches and set the buildings aflame; trapped Christians could be heard crying kyrie eleison--"Lord have mercy!" in Greek--while being roasted alive. Hysterical "women covered their children, like chickens, so as not to be separated from them, either by sword or slavery." About half of the city's seventy thousand citizens were slaughtered, the rest hauled off in chains. There was such a surplus of human booty that when the caliph came across four thousand male prisoners he ordered them executed on the spot. Because there "were so many women's convents and monasteries" in this populous Christian city, "over a thousand virgins were led into captivity, not counting those that had been slaughtered. They were given to the Moorish and Turkish slaves, so as to assuage their lust," laments the chronicler. When the young emperor, Theophilus (r. 829-842), heard about the sack of Amorium--his hometown, chosen by the caliph for that very reason, to make the sting hurt all the more--he fell ill and died three years later, aged 28, reportedly from sorrow. Meanwhile, the Muslim poet Abu Tammam (805‐845) celebrated the caliph's triumph, since "You have left the fortunes of the sons of Islam in the ascendant, and the polytheists [Christians] and the abode of polytheism in decline." Interestingly, some of the arguments used by Muslims indicate that they acknowledged Christ as the Prince of Peace and Muhammad as the Lord of War--and played it to great effect. One Theodore, a Christian cleric who fought in defense of Amorium, was goaded as follows: "We know that you forsook the priestly office, became a soldier and shed blood [of Muslims] in battle. You can have no hope in Christ, whom you abandoned voluntarily, so accept Mohammed." Theodore replied: "You do not speak truthfully when you say that I abandoned Christ. Moreover, I left the priesthood because of my own unworthiness. Therefore, I must shed my blood for the sake of Christ, so that He might forgive the sins that I have committed against Him." In the end, none would recant; and so, on March 6, 845, after seven years of torture and temptation failed to make them submit to Muhammad, all 42 Christians were--like their 21 spiritual descendants, the Coptic/Ghanaian martyrs--also marched to a body of water, the Euphrates River, ritually beheaded, and their bodies dumped into the river. In the video of the 21 martyrs made by ISIS, some could be seen mouthing, "Oh Lord Jesus Christ" immediately prior to having their heads carved off. Commenting on this, Coptic Orthodox Bishop Anba Antonios Aziz Mina, said: "The name of Jesus was their last word. Like the passion of the early martyrs, they entrusted themselves to He, who moments later, would welcome them into his embrace." Sadly, past and present, some things do not change. For more examples throughout the centuries of Christian martyrs of the Islamic jihad, see the author's recent book, Sword and Scimitar: Fourteen Centuries of War between Islam and the West.